Mike Lieberman is in my kitchen today talking about his personal connection to food, his addiction to his produce and his fear that we might be banned from growing our own food. 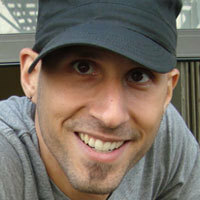 Mike Lieberman started urban gardening and growing some of his own food in May 2009 on his fire escape in New York City. He inspires others to start growing their own food on his blog Urban Organic Gardener. Lieberman believes that growing just one herb or vegetable will make a difference. Living organic to me is important because living that way makes sense to me. Food is what nourishes us and keeps us healthy. We have become so disconnected from food that we have now found it ok to use chemicals on them. We don’t see the correlation between the health of our society and what people are consuming. I think that there is a strong connection between the two, which is I chose to live organically and chemicals free. I think I’d have to say pancakes. My dad used to make chocolate chip pancakes every Saturday morning and they remind of those times. My refrigerator because it’s where all of my produce is stored. Haha. The one tool that I likely couldn’t live without is my Vitamix blender. Green smoothies have been my staple breakfast for the past three years. What magazine, website, book, album or product are you most obsessed with right now? I am not really obsessed with one specific website, but more with social media. Twitter and Facebook users are becoming more conscious about their food. I also just finished reading Crush It by Gary Vaynerchuck. 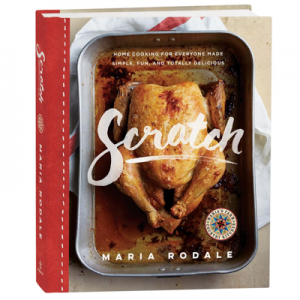 That book got me all kinds of fired up to make things happen in my life and with my projects. I think what’s going on with the S510 Food Safety Monetization Act 2010 that’s making it’s way through government now. It’s a scary thought that growing your own food could be made illegal. To make a long story short, we would be totally reliant on one company to supply us with all of our food. It violates the human right to food and is like wanting to charge people to breathe. It’s being positioned as a Food Safety Act, but it’s really about taking away our rights and having complete control over us. 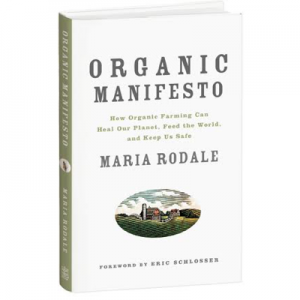 [Note: Based on thoughts expressed on Rodale.com, Maria’s Farm Country Kitchen, and in Organic Manifesto, Rodale Inc. supports the bill (with the inclusion of the Tester Amendment). I get my news from Facebook and Twitter. I’ve been keeping close track of Senate bill S.510, and I’ve read the summary of it. I don’t claim to be an expert, but as far as I know, there’s nothing in the bill that would prevent us from having our own gardens and growing our own food. There are things in this bill that I disagree with, but it seems to me that the idea of it making our gardens illegal is a scary rumor that got started around. I do fear that the bill will interfere with farmers’ markets, which of course are NOT the source of the big outbreaks of food contamination. But I didn’t see anything in the bill that could make it illegal for us to grow our own gardens. I think there would be a mass revolt if anyone tried to stop all of us organic gardeners from growing our own gardens! OK…A few minutes after my first post here, I received an email with a link to an article about S.510 and S.3767. The article claimed to be exposing the truth about these bills, and it was very scary stuff, indeed. Among other things, it stated that these bills would take away our right to garden or grow any food, that farmers would be put out of business and ALL food would come from one Big Ag company (I won’t say the name, but most would be able to guess the company I’m referring to), and there would be dire consequences for any farmer or person who tried to grow their own food. This article made it sound as if we’d be living in a police state, with some sort of “food court” that was run by Big Ag and had no government oversight. And it went on to say that homes and farms would be “stolen” away by the government so that people would have nothing and would be desperate and would be forced to obtain all of their food from only one Big Ag source. Now…what I want to know is just how much of this is true and how much of it is scary sensationalism? Does anyone know? I’ve looked and looked and tried to find a reliable source of information, but everything I’ve read is either very frightening, or it’s so long and cumbersome that it’s impossible to understand the provisions of these bills. I can’t believe that the government would try to prevent farmers and citizens from growing food. It seems to me that that is a basic right for all of us–to be able to grow our own food in our own gardens, if we so wish. It seems impossible that the government would try to stop that. But is it possible? I don’t know, and I really, really want to find some honest and accurate answers. Attempting to read the entire bill is not a good answer, because it’s very, very long and is worded in ways that make it difficult or even impossible to really understand. And one of the things I’ve often read is that it’s purposely worded that way, so that the average citizen won’t understand what the bill says–so the bill can be pushed through, and then the government and Big Ag will have unlimited power to do as they wish. But, is this true?!?! I have no idea, because I can’t find any accurate and reliable source for information. Does anyone know where we can get the REAL information on this bill? There are short, easy to read summary documents and a “Facts and Myths” document on Congresswoman Rosa DeLauro’s (the bill’s sponsor in the House) website at: http://delauro.house.gov/legislation.cfm. You will see a section specifically for this bill at the bottom of the webpage. Kate–THANKS so much for sharing this information! Having read this I believed itt was very informative. I appreciate you taking the time aand effor to put thiss content together.